Often times children ages 4 to 6 have very tiny hands, making it difficult to manage the geography and weight of the piano keyboard. Or perhaps a parent is interested in exploring their child’s musical ability at an early age without the practice demands of private lessons. Historically speaking, students who start in this age group are primed to develop advanced skills in reading, finger technique, ear-training and musicianship with earlier entry into private instruction. Younger children learn the fundamentals of the musical language in a fun and playful environment, while participating in small group music lessons. Immerse your little ones in the joy of music, as they naturally absorb the fundamentals of the musical language in a fun, relaxed environment with caregiver. Melody/Harmony, singing, solfege, rhythm, music notation and keyboard technique for tiny fingers! Small group classes holds up to 6 children (plus caregiver), and registration is available first come first served. Melody/harmony, singing, solfege, rhythm, reading/notation and keyboard technique for smaller fingers! 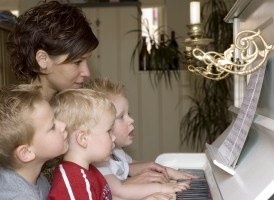 A small keyboard for practicing at home and class curriculum is required for each class.